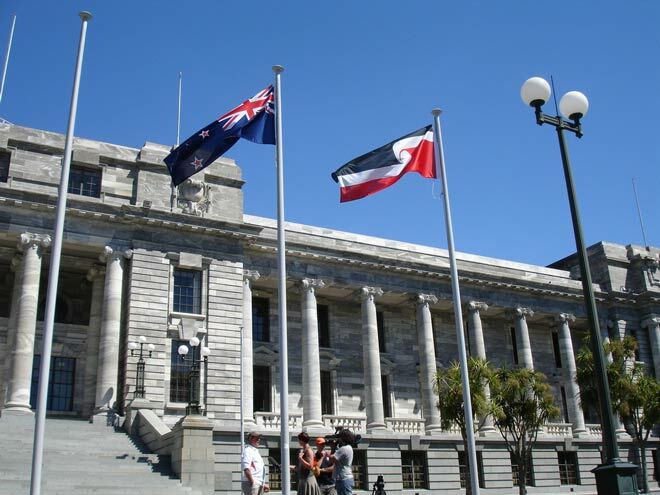 The national Māori flag (also known as the tino rangatiratanga flag), right, flies beside the New Zealand flag at Parliament on Waitangi Day 2010. The Māori version of the Treaty of Waitangi guaranteed Maori 'te tino rangatiratanga' of their people, land and other possessions. In the English treaty this term was given as 'full exclusive and undisturbed possession'. From the late 20th century, Māori agitated for a greater degree of 'tino rangatiratanga' (broadly defined as autonomy or self-government) within the current political system. In the 21st century, the tino rangatiratanga flag has been adopted as a national Māori flag. From 2010 it flew on the Auckland harbour bridge, at Parliament and in other public venues.